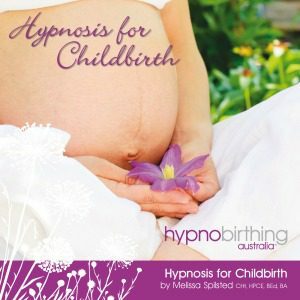 ‘Hypnosis for Childbirth’ has been designed for both natural and caesarean birth. These hypnosis and relaxation techniques can be used to prepare your mind and body prior to your birthing day. The album consists of two long play tracks. As this album is designed to induce very deep relaxation. *Shipping for this physical CD is included for Australia only. Contact us directly for international shipping rates. Both tracks are professionally guided self-hypnosis, so it is important that you do not play these tracks whilst operating a moving vehicle or when engaged in an activity that requires attention. The first track is a Fear Release. Allow yourself to release any fears relating to your birth, keep yourself calm and relaxed and positively anticipate the birth of your baby. You may only need to play this track on a couple of occasions leading up to your birthing day. When you release the fears – they are gone. The second track teaches you deepening techniques that can be utilised during birth. It is recommended that you practice this track on a regular basis. Take some time out of your day, relax and enjoy this beautiful time as you bond with your baby and reprogram your subconscious mind for a calm and positive birth.